Many devotees of St. Therese of Lisieux are familiar with the detail of a stained glass window that is seen in our featured image. But few know the story of the Discalced Carmelite nun and brilliant artist who created this and so many other magnificent windows throughout England. Margaret Agnes Rope (1882-1953) studied art at the Birmingham Municipal School of Art at the beginning of the 20th century, specializing in the manufacture and painting of stained glass. Upon completion of her studies, she worked from her home and in London, accepting many commissions in England and overseas. 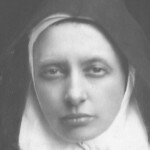 In 1923, Margaret entered the Discalced Carmelite monastery at Woodbridge in Suffolk, taking the name of Sr. Margaret of the Mother of God. Her prioress encouraged her to continue her work in stained glass manufacture and she virtually supported the community for decades. As a result of the community’s growth, and later development surrounding the monastery, the nuns eventually moved to Quidenham in Norwich in 1948. In her declining years, Sr. Margaret designed the many stained glass windows that still adorn the monastery church, works carried out by her cousin ‘Tor’. Photographer Gordon Plumb curated a number of his excellent photos from a 2016 exhibition featuring the work of Margaret Agnes Rope at the Shrewsbury Museum and Art Gallery. The exhibition, ‘Heavenly Lights: The Untold Story of Stained Glass Artist Margaret Agnes Rope’ shared “the untold story of one of the great female artists of the early twentieth century”. Learn more about the exhibition here. See Gordon Plumb’s Flickr album here. Her work soon became well-known for its jewelled dazzling colours, its personal stamp, its startling modernism, and its sense of spiritual vibrancy.